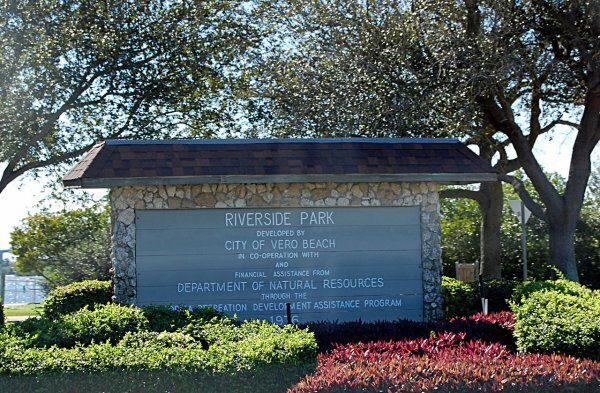 Riverside Park is a public park located in Vero Beach, Florida. It is located along the Indian River on the beach side of the Merril P Barber Bridge. 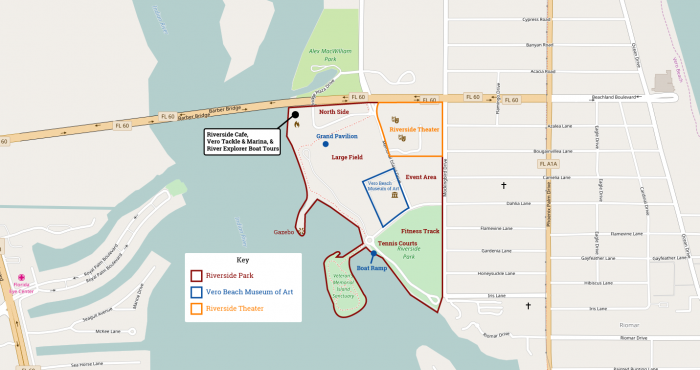 The park is situated on approximately 65.73 acres, excluding the Vero Beach Museum of Art, Riverside Theater, the fire station, and Riverside Cafe, which are all located on site. The park was developed by the City of Vero Beach in 1976 with help from the Department of Natural Resources and the Florida Recreation Development Assistance Program, according to signs at the park. Events at the park are listed at the bottom of this article. The address of the park is 3200 Riverside Park Drive, Vero Beach, Florida 32963. Google Maps has the address of the park as 3280 Riverside Park Drive and centers the park at the event / exhibit area on the east side of the park. Below is a Google Map of the park where you can get directions to the park. Another map is listed below with some of the amenities and features listed. Above is a map of Riverside Park with some of the features shown. Base map originally by Openstreetmap Contributors. Modified by NavFile. Riverside Park is a scenic park that is right on the east coast of the Indian River (facing west from the shoreline). The park contains many sidewalks and walkways to explore the area. A concrete walkway is located on the riverside and has an extension that goes out into the river. At the end of the extension is a gazebo with views of the river. The gazebo has been named the Virginia Robinson Downey and Dixon P. Downey Gazebo, however, we have not confirmed this. More of the amenities are listed below in detail under their individual sections. The northern portion of the park, near the bridge, has walkways and pavilions. Also located in the northern section is a fire station, the Riverside Cafe, Vero Tackle & Marina, and River Explorer Boat Tours. Paddle board rentals may be available.The north side also has the Large Field and the Grand Pavilion, which are to the south of the before mentioned areas. The north side of the park contains a large field that is mostly used for multipurpose activities. It is across the street from Riverside Theater and next to the Vero Beach Museum of Art. When the park has large events the field is used as a parking lot for vehicles. There is usually room to play various sports on the field. Their are parking lots to the east and west of the field. A restroom is also located on the east side of the field. North of the Large Field is the Grand Pavilion, which is a large gazebo type structure that can be used for special events. It is basically three gazebos connected together. 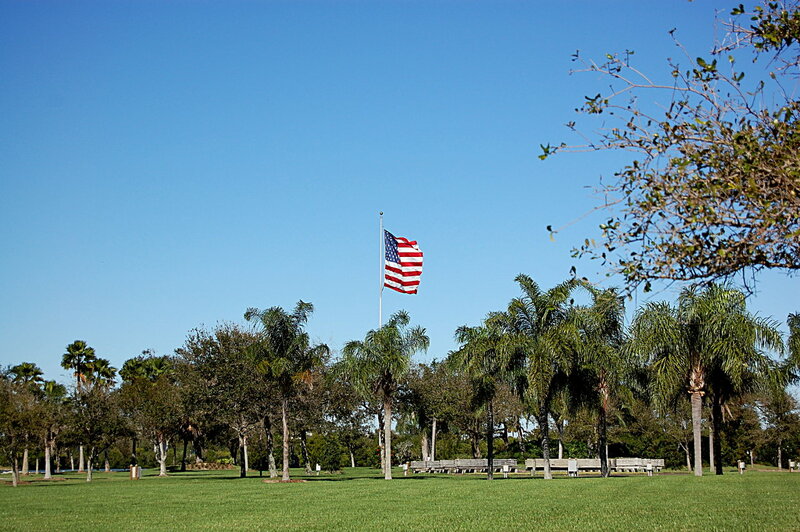 One important area of the park is the Veterans Memorial Island Sanctuary. Veterans Memorial Island Sanctuary was built to honor the men and women who served the country in defending freedom. This area can be accessed from the end of Dahlia Lane on the southwest side of the park. This area is very well maintained and has numerous memorials to commemorate the men and women of the armed services. There are also great views of the Indian River from the island. Some may refer to this island as the round island at Riverside Park in Vero Beach. The Riverside Park Boat Ramp is located to the left of the entrance to Veterans Memorial Island Sanctuary. The boat ramp is approximately 83.24 feet wide and can handle multiple boats. There are 26 boat ramp parking spots that are approximately 40 foot in length and 9 feet wide. The parking spots are located directly in front of the boat ramp. Additional parking for vehicles and boat trailers can be found at the large field located to the north. The south side of Riverside Park contains tennis courts, a playground, and a fitness course. There are 10 tennis courts and a racquetball court (racquetball court not confirmed). A small clubhouse is located on site that contains vending machines and restrooms. The park has a fitness trail that is located on the south side of the park. The trail has multiple exercise activities along the trail. The trail is located among multiple oak trees, which shades the area. On the west side of the park is an area that is mostly used to hold events. This could also be considered the west fitness trail, as the area has pathways similar to the fitness trail located to the south. Riverside Park is used to host many events throughout the year. Below is a list of some of the events that the park has held or will hold. The park usually hosts a boat show that happens multiple times during the year. The next boat show at Riverside Park looks to be happening on November 18th & 19th, 2017, 10:00 AM to 5:00 PM. There is no fee to attend the event. The website for the event appears to be located at http://www.verobeachboatshow.com. You can get more information there. 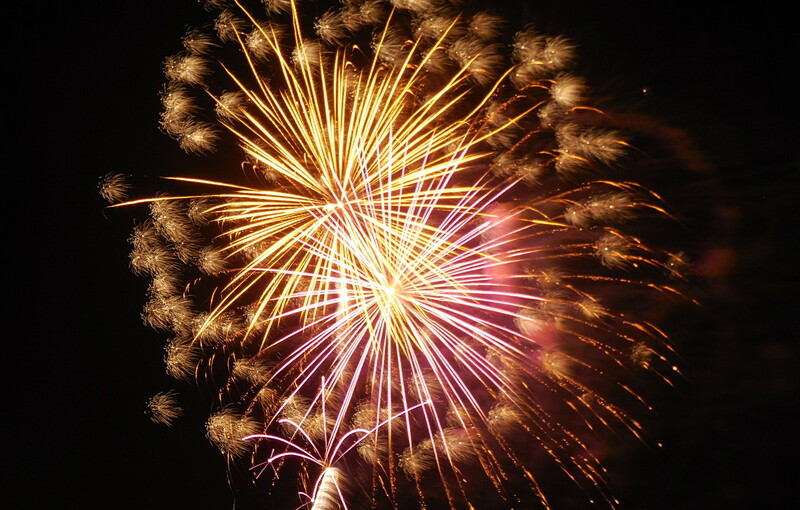 One of the events that happens almost every year at the park is the 4th of July or Independence Day celebration. To commemorate the Declaration of Independence the City of Vero Beach holds a celebration at the park with fireworks in the evening. There are various vendors that exhibit at the park during the day. Fireworks are launched from the river around the location of the gazebo. This may be the only time every year that Riverside Park has Fireworks. Below is a photo of the 4th of July fireworks at the park. This year (2017) the Independence Day celebration is taking place at the park from 4:30 PM to 10:00 PM. The city is also hosting what it calls a Food Truck Frenzy at the event. Food Trucks and vendors be at the event. The city’s web page on the event is currently located here: http://www.covb.org/index.asp?SEC=680E1508-E716-4F49-8FD7-D571ACF45247&Type=B_BASIC. Above: Photo of the fireworks during the 4th of July at Riverside Park. At the various events that occur at the park, there are usually a number of food trucks in attendance. NavFile can not confirm if there was a dedicated Food Truck event at the park, however, this may have occurred in the past. The Food Truck Frenzy event listed above in the 4th of July section is the main food truck event that is hosted at the park. The Under the Oaks Fine Arts & Crafts Show is held at Riverside Park every year in March. This is one of the top events that is held at the park every year. It is scheduled to be held on March 9th, 10th, and 11th in 2018. The event is held in what we call the “event area” which is the area with the oak trees that is right next to the Riverside Theater. The event is coordinated by the Vero Beach Art Club. Their website with information about the event is located here: http://www.verobeachartclub.org/events1.php?id=20. The Indian River Region of the Antique Automoblie Club of America (AACA) hosts a car show every year at Riverside Park. As you can tell by the name of the automobile club, this car show focuses on antique cars. The last car show was held on March 18th, 2017. You can find out more about the events the Indian River Region holds on their event page: http://local.aaca.org/indianriver/events.php. The Riverside Theater holds free outdoor concerts almost every weekend. The theater is right across the street from the park and is right next to the event area. The concerts are usually held on Fridays and Saturdays, starting at 6:00 PM. You can learn more about their free concerts on their website: http://www.riversidetheatre.com/free-outside-concerts. The park holds many events throughout the year. Other events will be listed here in the future. Have an event at Riverside Park in Vero Beach? List it here at no cost. Contact our team to notify us of your event. NavFile is not affiliated with any of the events listed here on this page and has done research on the events independently.